2. Tessa Blanchard (@teamTblanchard)-One of the very few viable options at #1 this week (aside from Murdoch) when it came to the official voters’ ballots. She had a VERY impressive weekend as she won the ECWA Women’s Super 8 and became ECWA Women’s Champion. She defeated Tina San Antonio, then Renee Michelle, and then Jenny Rose in the Finals of the tournament. The first tournament showed immediate prestige to the winner as she grabs a #2 ranking this week as she contended for the #1 spot as well. On 2 voters’ ballots, she WAS #1. Great weekend for a talent that is only getting better and better as the year goes on. This will slip her into the IPR 100…can she build on her spot before the end of the year? #3 in the online poll with 28 votes. 3. David Finlay Jr.-He is the NEW POW Junior Champion after defeating Scott Saxon and Veit Muller for the title on 10/10 and then defeated Scott Saxon to retain the title on 10/11. He has been on our radar for a while, but had yet to crack the Top 10. This week was special as he did it and in a big way. 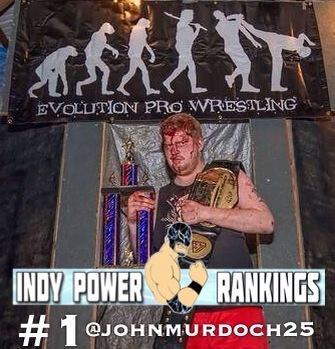 He’s been having a very good year so far and this ranking just further cements that fact. If he can keep this roll going, he’ll continue to contend for the Top 10 for the rest of the year, proving that Europe has a strong claim for having some of the best talent in the world. 4. Karsten Beck-Last week’s #1 keeps his impressive run going as he defeated Robert Dreissker on 10/11 at wXw. While his week was nowhere near as impressive as many others, his ranking just goes to show that being an incumbent (especially in the top spot) can help future rankings. We will have to sit back and see if he can continue his success to maintain a spot in the Top 10. Regardless, this high ranking once again helps him move up in the year end IPR 100. Like Finlay, he’s showing once again that Europe has a ton of underrated talents that people need to go out of their way to see. 5. Joseph Schwartz (@HammerSchwartz)-“The Hebrew Hammer” claims his first ranking as he teamed with Chuck Stein to win 2 Triple Threat Elimination Tag Team Matches (the first vs. American Vikings & Nate and Wellington) at PWAS Detroit to win the Tag Team Titles there on 10/10 (vs. Hystars & Hooligans), then outlasted 6 others in a Gauntlet for #1 contender to the UPW Heavyweight Title the very next night. 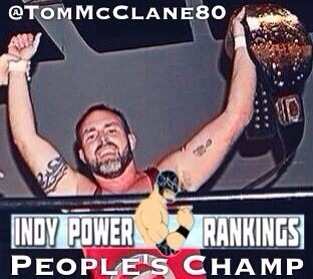 While he has been ranked in the Tag Team Top 5 with Randi West earlier this year, this impressive weekend marks the first time he’s hit the singles Top 10. With him doing good things all over the Midwest, this may not be his last this year. 6. Kenny Williams (@KennyWilliamsUK)-Despite no fan support in the online poll, the ICW Zero-G Champion defeated Kid Fite to retain the title on 10/10 and then defeated Danny Hope & Stevie Boy to retain the title in a 3 Way on 10/11, then beat Stevie Boy to retain the title on 10/12. 3 wins. No losses. That’s one fantastic weekend, which like many others in this week’s Top 10, equals Williams’s first ranking in the Top 10. He has been very successful recently but somehow he’s been snubbed time and time again, but not this week. He’s 1 of 4 talents in Europe that found their way into the Top 10 and with his title being defended frequently, he’ll probably be back sooner than you might think. 7. Jay Briscoe (@jaybriscoe84)-The ROH World Champion went to a No Contest vs. Rhino on 10/9, then teamed with Rhino and Mark Briscoe to win a 6 Man Tag later in the night. He also made the last two eliminations to win the Champions vs. All Stars match at Ring of Honor on 10/11. His weekend was impressive enough to get a #1 vote from one of the official voters, but it wasn’t quite enough to push him any higher than #7 this week. Perhaps it was his lack of singles victories that kept him from going higher, but regardless, he had a very good weekend and proved that he is a very worth ROH World Champion. A title that he does not plan to relinquish again without a fight. 8. Rampage Brown (@RampageBrown)-The TCW Champion defeated DJ Hyde on 10/8 to retain the title, then defeated Damian O’Connor by Pinfall at Discovery Wrestling on 10/11 and then beat Kid Fite at ICW on 10/12. Honestly, it’s surprising he didn’t get any #1 votes or fan support on the online poll. It really was a fantastic weekend for one of the top talents in the UK. Like so many others, he keeps getting mentions, but can never quite move up the Top 10. At #8 this week, this is a great chance for him to build on that ranking before the end of the year. This is a building block to try to move into the IPR 100. 9. Biff Busick (@_StarDESTROYER)-The CZW World Champion defeated Martin Kirby on 10/8 to retain the title, then beat Stixx at Southside WE on 10/10, lost to Martin Kirby at SWE on 10/11 then beat El Ligero to retain the title on 10/11 (in what has been called one of the best CZW Title matches in recent memory) and then beat Pete Dunne to retain the title on 10/12. He’s a former #1 and he’s ranked once again after a brief absence from the Top 10. He’s having a very good year, but every time he gets some momentum, he gets tripped up (the loss to Kirby being an example of that) but his wins this week, despite the loss, were enough in the voters’ minds to get him into the Top 10 once again. 10. Paul London (@LondonFu)-Surprisingly, this is the first time in the Top 10 for this well-known and well-respected superstar. Granted, like several others, he didn’t get any fan support this week, but he did get the votes from the official voters to get him in. 1/2 of the ICW Tag Team Champs beat Gabriel Angelfyre for the PWA European Allstar Title on 10/11 then teamed with Brian Kendrick to beat The Sumerian Death Squad to retain the titles on 10/12. It was a very good weekend…maybe not “the best” but certainly good enough to get him his first ranking this year (in singles). People’s Champ. Tom McClane (@TomMcClane80)-He became NEW WBW Heavyweight Champion after defeating Jake Ashworth for the title on 10/11 and then built on that by pulling in 92 votes to win the online voting competition. It was a very competitive battle in the online poll up until a few hours left when McClane distanced himself from Murdoch to make sure that he grabbed some further accolades for himself this week. ← Who should be #1 in the Tag Team Top 5 for the Week of 10/13/14?